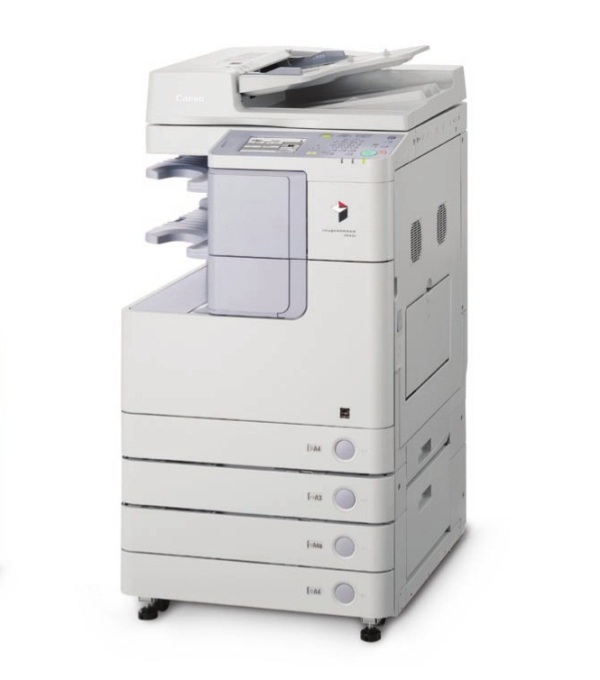 One of the more advanced black and white office printers from Canon, the Canon IR-2520i offers the versatility of a printer, copier, scanner, and fax machine, integrated in one easy to use machine. It is ideal for small to medium workgroups looking for a cost-effective way to address their printing demands. The Canon ImageRUNNER IR-2520i has a large input capacity, saving users the hassle of constant media refilling. The IR-2520i mono laser printer is energy efficient and has a good range of configuration options, ideal for all kinds of users. However, the device is not the fastest, and can only print and copy in black and white. The Canon IR-2520i black and white laser printer measures only about 565x680x681 mm, very compact for a device that packs four machines into one. The ImageRUNNER 2520i copier is designed for large format printing, capable of handling media up to A3 in size. Its paper capacity can be increased to a maximum of 2,000 pages, ideal for those with heavy print requirements. The Canon IR2520i printer features a touch screen LCD panel for easy navigation of menus and other printer options. The device can be networked via the Ethernet interface, while single users can use the USB port for fast data transfer. Duplexing comes as a standard for the Canon IR-2520i laser multifunction printer, along with other convenient paper handling options. It comes with a larger memory capacity that is twice the 2520 version (512 MB). The Canon IR 2520i monochrome printer can produce images and documents with high resolutions up to 1200x1200 dpi. At best, the scanner produces 600x600 dpi images. Many optional accessories may also be purchased to improve the device's performance. Original Canon toner for the IR2520i printer is surprisingly cheap and delivers a low cost-per-page. The Canon IR-2520i prints at a rate of 20 ppm, which is not exactly slow, but is below average compared to competing models. The IR-2520i all-in-one printer also limits users to black and white printing and copying.